With Coach Jamy Bechler. Coach Becher has coached at the NCAA Division I, II, III and NAIA levels, as well as both men and women during his coaching career. He was one of the youngest NCAA head coaches in the nation when he took control of his first program at the age of 27 years old. Regardless of the school or level of play, his teams have consistently been among the nation’s elite when it comes to rebounding, including 2014 when they set a national record for having a +19.9 rebound margin. 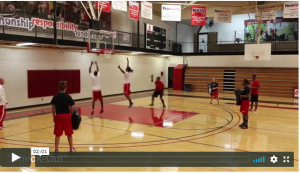 Two drills – for rebounding when guarding a perimeter player. Championship Rebounding – Check Out from coachtube.com on Vimeo. Championship Rebounding – Hit and Get from coachtube.com on Vimeo.